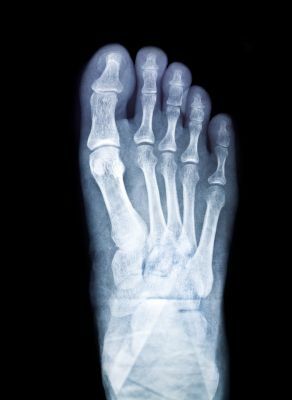 Forefoot Breaks: A Toe or Metatarsal Fracture | Podiatry Associates, P.C. The thinner something is, the more susceptible it can be to serious damage. Compare a new branch to a tree trunk. You can snap a little, thin branch fairly easily. A tree trunk, though, doesn’t just snap—you need far more force to break it. Now think about the bones in your feet. They are more like branches than tree trunks. The thin bones in your forefoot are strong enough to do their jobs, but a sharp force can break them easily, leaving you with a metatarsal fracture or a broken toe. Where Are Your Metatarsals, Anyway? Your metatarsals and toes are actually important members of your lower limb structures. The metatarsals are long, thin bones that attach the arch of your foot to your toes. They end in the ball of the foot, where they become one of the main surfaces in your sole that help you walk. Your toes play a role in walking and standing, too. They spread out and press into the ground to help you balance, and push off the ground when you take a step. Together, your toes and metatarsals make up your forefoot. Damaging these bones significantly weakens your lower limbs and makes it very painful for you stay on your feet. A fracture is any kind of break in your bone tissue. Anywhere you have bones, you can develop a fracture. Your feet have a fairly high risk, since they are under a lot of stress every day when you stand or walk. In fact, overuse can lead to small cracks in your metatarsals called stress fractures. Most broken bones are traumatic injuries, though, which means they happen when something suddenly damages your feet or toes. Stubbing your foot, tripping, falling, twisting, and dropping something heavy are some of the most common ways people break a metatarsal or toe. Metatarsal and toe fractures, like other broken bones, are quite painful. The area around the break quickly becomes inflamed and fills with fluid, causing swelling. Normally a fracture damages blood vessels as well, creating some bruises around the painful spot. You may or may not be able to put weight on your limb depending on where the break is—in some cases, you can still walk. You’ll need to have your foot thoroughly examined to diagnose the damage and determine the extent of the problem. Dr. Cynthia Oberholtzer-Classen and the team will use diagnostic images to get a clearer picture of your foot. Once our staff understands the problem, we can help you get the right treatment. In most cases, conservative care is all you need. You’ll have to remove weight and pressure from the injured foot. Your bone will need to be immobilized, too. For toes, this might just mean buddy-taping it to a healthy neighbor. If the fracture is more complicated, you might need to wear a special boot instead. For a metatarsal fracture, you will most likely need to wear a special walking boot or a cast. Avoid all hard-impact activities and ice the painful spot when it hurts to decrease inflammation. Once the damage has healed, you’ll be able to start walking normally again and recondition your lower limbs for your activities. Don’t take your metatarsal bones or your toes for granted. Fractures in your forefoot need proper care to heal correctly and avoid chronic pain later. Let Dr. O and our team at Podiatry Associates, P.C., help you treat your feet right. Use our website to request an appointment at our Castle Pines or Parker, CO, offices. You can also call (303) 805-5156 to reach us.